Arizona State University provides continuing education services to several Arizona 55+ communities. For many active adults, amenities are a major consideration when choosing a new community. While some seek resort-style pools and on-site conveniences, others want to ensure they can pursue their intellectual interests as well. In response to the needs of modern active adults, many retirement communities now have continuing education centers where residents can attend lectures and classes. We’re exploring five great communities with continuing education centers in the popular retirement destination of Arizona. Sun City Grand is well known for its amenity-rich lifestyle. This active adult community is open to those aged 45 and up. With well over 9,000 residences, homebuyers can choose from a large selection of condos, single family homes, and attached homes. Sun City Grand offers a vibrant atmosphere where residents can keep their mind sharp at the ASU Lifelong Learning Academy. Homeowners in Sun City Grand can attend classes on a variety of subjects, including history, art, music, current events, science, and more. Whether residents want to discover new subjects of interest or pursue what they’ve always been passionate about, the ASU Lifelong Learning Academy makes it easy. Additional amenities include four golf courses, walking and biking trails, and resort-style pools. For home buyers interested in a high-end community with continuing education, Trilogy at Vistancia is a top choice. Development started in 2004 and is ongoing, so homebuyers have a selection of new and resale homes to choose from. Upon completion, the community will have 5,450 single-family homes. A major highlight of Trilogy at Vistancia is its Center for Higher Learning. Designed to meet the changing needs of today’s active adults, this continuing education center offers an exciting curriculum. Courses include financial planning, foreign languages, photography, wine appreciation, and more. There are also different clubs that meet up here, such as the STEM club (Science, Technology, Engineering, and Math). In addition to the on-site learning center, the community has two luxurious clubhouses with swimming pools, fitness centers, and more. Altura provides a well-rounded lifestyle in a tranquil desert setting. This 55+ community consists of 240 single-family and attached homes in a gated environment. Since development is still ongoing, homebuyers can select from new and resale homes. The on-site Arizona Senior Academy provides intellectual enrichment for residents. This continuing education center offers a great lineup of classes and lectures on topics such as global warming, cooking, art, the humanities, health care, and more. Arizona Senior Academy regularly features interesting guest speakers and panel discussions. There are also organized field trips available, as well as regular music and art performances. With a robust learning center and additional amenities, residents of Altura can stay active, social, and engaged within their community. Sun City Festival is the second Del Webb community on our list, and it offers the amenity-rich lifestyle that has contributed to Sun City's good reputation. Development began in 2006 and is still ongoing, giving homeowners a great selection of new and resale homes. Once complete, this 45+ community will be home to 7,200 single-family residences. 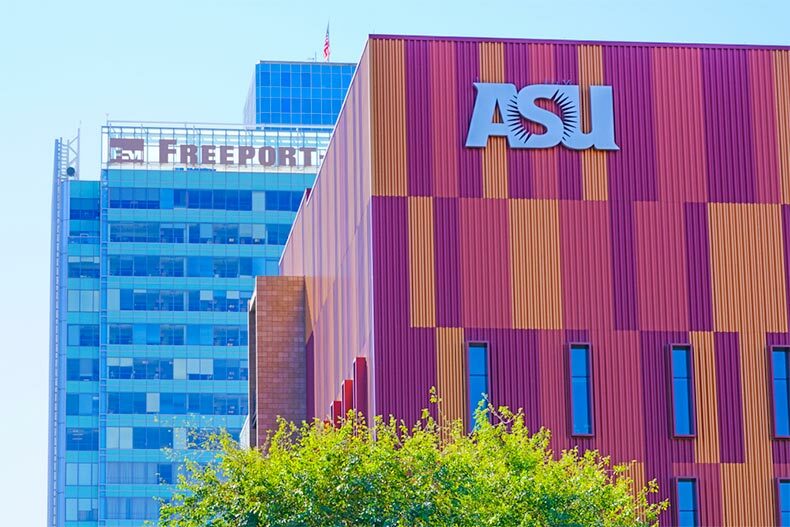 With the on-site ASU Lifelong Learning Academy, residents can explore their interests and make connections with like-minded neighbors. This top-notch learning center features classes such as financial planning, literature, computers, and foreign languages taught by ASU professors. Sun City Festival’s large recreation center also keeps residents busy with a fitness center, pool and spa, softball stadium, and more. CantaMia is a beautiful 55+ community situated within the master-planned community of Estrella. With a focus on sustainable living, it’s a top choice for active adults seeking a more modern community. Development is still ongoing, but upon completion, CantaMia will have 1,700 single-family homes. At the on-site learning center, residents can immerse themselves in their study of choice. This popular learning center provides classes on social networking, astronomy, gardening, genealogy, how to maintain a healthy lifestyle, and more. There is also a demonstration kitchen for putting new cooking skills to the test. With a library, pools, scenic lakes, and massage rooms, CantaMia makes it easy for residents to enjoy their best years.